Hooded Mergansers (Lophodytes cucullatus) are a diving duck native to North America. 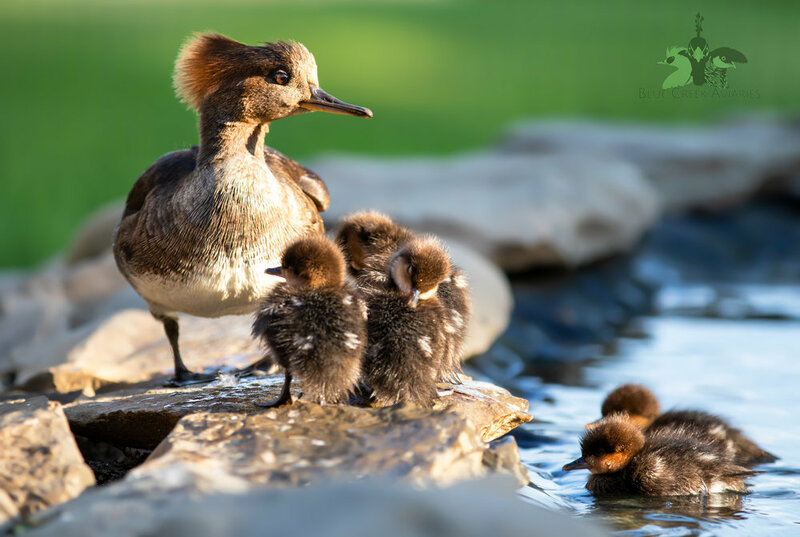 As the name suggests, Hooded Mergansers are literally “hooded” with a large crest. When in breeding plumage, the males have an unmistakably large white crest outlined in black, creating an attractive contrast. The black continues from the head all along the back and tail. Their upper throats are black, while their breast is white. Along their mantle is a white and black barred pattern. Similarly, along their back, there are wing coverts that are black with a bold white line, forming striking plumes. Their flanks are cinnamon-brown colored and are overlaid by fine black barring. Lastly, the drakes have a fine black bill and a bright golden eye. The hens too have a “hood,” but theirs is smaller and cinnamon colored. Their overall body color is brownish-grey, and their wing coverts bear the same pattern as the males’ coverts do. Hooded Merganser hens have brown eyes and brown and yellow colored bills. In eclipse plumage, Hooded Merganser drakes resemble hens. This species is classified as Least Concern by the IUCN, and is readily available in captivity. Being the most affordable merganser species, and the smallest, Hooded Mergansers are a great duck to begin with before moving on to the more challenging sea ducks. Since they are naturally diving ducks, Hooded Mergansers require diving-depth water (at least 18 inches deep). In the wild, their diet consists of aquatic insects, small fish, crayfish, and other similar creatures. In a captive setting, minnows can be released into their ponds for enrichment and supplemental protein. It is a joy to watch Hooded Mergansers diving and the males displaying with their raised hoods. Typical with any mergansers, Hooded Mergansers can become aggressive during breeding season and can chase other birds away on a regular basis. While I have not had this get in the way of breeding success, it is something to consider especially if a small species is being bullied. Their eggs resemble a golf ball and have a thick shell. The incubation period for Hooded Mergansers is 28 days. I find that my Hooded Merganser hens nest well, though I do remove the ducklings prior to hatch and then artificially rear them. Like the Smew, they too are wet brooded in aquatic rearing cubicles from Leucopsis Products. The ducklings can be tricky to get eating, but they should be fed Mazuri Waterfowl Starter. I should have surplus Hooded Mergansers this fall, so inquire about being placed on my waiting list. Since this is a diving duck species, I will be requiring information as to your facilities to ensure they will be placed in a good home.